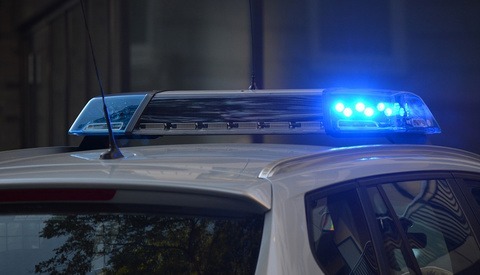 Two Denver police officers have been disciplined after an investigation into an incident during which they handcuffed a journalist who was filming an arrest from a sidewalk. 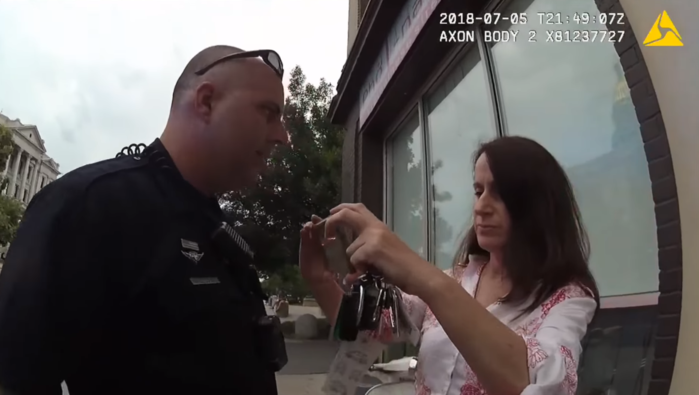 The incident happened on July 5, 2018 in Denver, when Colorado Independent editor Susan Greene began filming an arrest on a sidewalk. Officers Adam Paulsen and James Brooks told her to stop filming, and when she persisted, they handcuffed her and placed her in a police car, insisting that HIPAA laws (though the officers incorrectly stated what HIPAA stands for) superseded her First Amendment rights that she repeatedly asserted vocally. While handcuffing her, one of the officers told Greene to "act like a lady." After a seven-month investigation, the two officers were docked two days of pay, and the police department has said it has "reiterated to officers policies involving First Amendment considerations" in a training bulletin, though it's strange (to say the least) that a police department would have to issue a refresher on basic constitutional rights. The Denver district attorney did not press charges against the officers. It's unclear at the moment if Greene plans to file any sort of civil suit against the officers or the department, though she expressed mixed feelings, saying she was "encouraged" by the disciplinary action, but disappointed by things like the length of the investigation and its failure to address other issues like the officers' remarks. Tabloid news. I'd not stand filming an arrest because frankly, it's nothing to do with anyone else than the arresting officer and the person being arrested. What about Rodney King's famous arrest? I'm sorry, who? I don't mean to be rude, but some of us don't live in the US so not up to speed on current affairs and most certainly don't have the amendments things to quote. This is a journalist, and she had every right to record it, which was confirmed by the story. Technically speaking it's on a public sidewalk... so any citizen has the right to record. There is no expectation of privacy in a public space. Her filming is a not a matter of what anyone else would do; she had a right to do it and the cops were wrong to arrest her for doing it. Shows a lack of understanding of the law on the part of the officers. Even if she was wasting her time, it was hers to waste and not illegal. 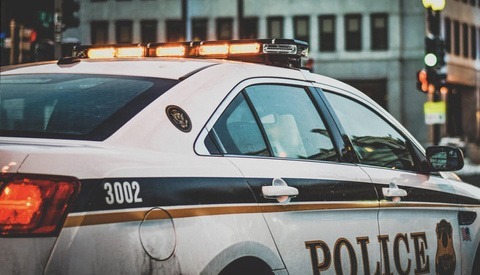 Also we've seen many instances over the last few years where a recording of an arrest or shooting has been the only proof of a police officer's wrongdoing. This was a big deal in the news here in Denver. The police admitted their mistake. These aren't the only cops to ever do this, mostly out of arrogance or ignorance. I've worked in Denver many times and my experience with police has been positive. I've done night shoots in alleys and on back streets and have had the police come up to me asking questions. They've never interfered or given me any grief once they knew what I was doing. The bigger problem is private security who think they can enforce all the laws that haven't been passed yet. Sure, but not over this crap. They appear to be in a crime scene and still investigating and she gets as close as she can, refuses to leave insisting on getting her 15 minutes of lame footage and then going further the moment she realized they weren't having it. Baiting officers for footage is a huge problem these days. Let them do their job. If you don't have a long enough lens to stay back, then keep your crappy phone in your pocket. If this is what happens when news corporations fire the professionals, we're screwed. I must say, you have a legitimate observation. I didn’t think of that point, good comment. This is a dangerous statement. The law doesn't get to decide what footage is lame, nor does it get to decide whether her motives for doing something determine the legality of her actions. It's dangerous for a bystander to draw the officer's attention away from a crime scene. Would she show up and stand there if they were involved in a shootout? Doubt it. If she can do it then can 20 other people show up like they are at Disneyland stomping all over potential evidence? Whether it's legal or not, it's every other month some idiot is jamming a phone in a cops face trying to piss them off so they can get a story out of it or even sue the police department. What's next, people hanging out in the police station with their phones out waiting for someone to get mad? You may be completely right, but it's of no relevance. The answer to your concern is changing the law through democratic and constitutional processes, not allowing police officers to make up the law as they go along. Giving any authority a free-for-all is a slippery slope. If she were interfering, then yes. But she's not. She's standing a safe distance away and holding a phone. If an officer can't deal with bystanders, then they shouldn't be in the job. Furthermore, this isn't why they arrest her. Again, allowing the authority which enforces the law to *decide* the law is a dangerous, dangerous thing. If this law about filming police officers is to be changed, then it needs to go through government, not giving police officers a license to do what they please. Uh that's her standing right next to the ambulance. That's her raising her hands to an officer's face 5 feet from a body on a stretcher. Not sure how this addresses any of my points. 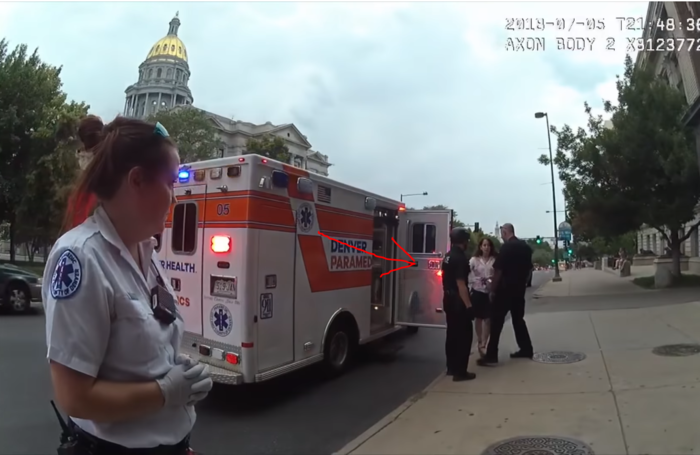 If she weren't filming and she were standing next to the ambulance, she would not be arrested. If she were interfering, then why have the officers been disciplined? Given the importance of due process in the US, why are you defending officers who are deliberately misinterpreting the law? Again, this is a dangerous precedent. It is simple. The officer was clearly having a conversation with her - he asked her to move away, probably multiple times. She didn't. They dealt with her. Would you rather they didn't handcuff her, but instead man-handled her and dragged her far enough away? The officers have been disciplined to avoid a public backlash, because there are too many people like you that seem to want to make an enemy of the police. People that have a problem with this kind of thing are the kind of people that break the law to be honest. The way they handled this was totally appropriate. People who get their legal text books out every time something like this happens are just handcuffing the police from doing their jobs. It isn't as if they shot her, beat her up, or tasered her. They removed her from a crime scene because she refused to move. "Not sure how this addresses any of my points." You need to practise your reading skills, sir. And who are you to judge what is a "safe distance away"? You aren't the one to judge. It is the law enforcement officer. Given the importance of due process in the US, why are you defending officers who are deliberately misinterpreting the law? This is the problem when people that's supposed to enforce the laws don't now the laws. ‘offender” of what they are being charged, and then, to read the “offender” their Miranda rights. No? No. The police DO NOT have to advise you of your miranda rights so long as they DONT question you ABOUT the alleged crime they are charging you with. Read that statement carefully please. Ex: Youre charged with simple assualt. The Officer can question you about who you are and other "simple" questions. But the instant they start to question you about the alleged crime youre charged with, then they are obligated to inform you of your rights. Even if they "suspect" you of commiting a crime and havent charged you, if they question you about it then you MUST be advised of your rights. Coming from 16 years of LEO experience. The supreme court has ruled that a public servant, conducting public work, in a public place (from a public place) can be filmed without infringment. This stems from the notion that a public servant, in the performance of their duties, has NO right to the expectation of privacy during the course of this action. This will probably be unpopular here... But I'm going to speak in defense of the officer involved. In the first few seconds of the footage, we see that paramedics are working on somebody on the ground. What we are watching isn't an arrest, per se. It appears to be a medical situation. It's possible that the reporter was filming the victim, not the perpetrator of the crime. If that was the case, then the officer citing HIPPA would've been appropriate. Likewise, if the person being treated was being taken into custody due to a mental health situation, HIPPA would apply. The fact that the body cam footage obscures that individual (and nobody else) would seem to indicate that whatever was going on, that individual was not "fair game." Clearly, the officer went too far by arresting the journalist. And his "act like a lady" indicates that he's long overdue for some sensitivity training. But the situation isn't as black and white as most photographers might first assume. Public Street , HIPPA does not apply. You have no reasonable expectation of privacy when in public . The law is pretty straight forward. It does not say You have no reasonable expectation of privacy when in public except in these situations. The cop was way out of line..
As someone who is a paramedic and a photographer, HIPAA (with two As, not two Ps - the Health Insurance Portability and Accountability Act) is not applicable here. HIPAA refers to me as a provider involved in your care, or a related party (the lab doing your blood work, the hospital billing department) not disclosing your PHI (Personal Health Information) without your knowledge and consent. It does not, and will not, ever apply to someone observing, and/or documenting a situation unfolding in public. 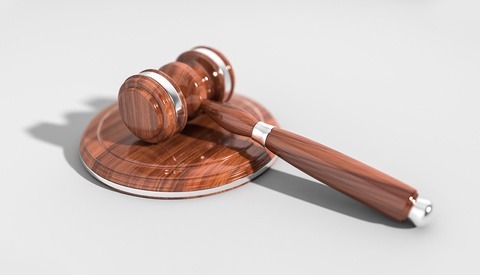 Now depending on who you are and why you are observing and documenting may lead to varying questions of discretion, dignity, privacy and the like, but these are moral issues. I've worked on plenty of public calls, from MVAs on the freeway to cardiac arrests inside a chain restaurant where people have had cell phones out. My interaction with people like that has varied from a "come on, really, do you need to have this recorded?" to having them move back if they are interfering with patient care (at which point you can become guilty of a crime, though still nothing to do with HIPAA). "Crime scene" part is not of my concern, that's for law enforcement.